Built around a 13-week video curriculum, DivorceCare support groups meet weekly to help you face the challenges of divorce or separation and move you toward rebuilding your life. Don’t go through separation or divorce alone. 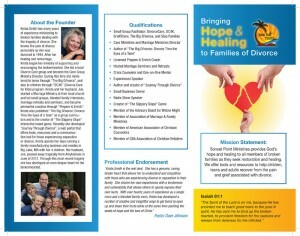 To find a DivorceCare group meeting near you, visit http://www.divorcecare.org/.